From 2001 to 2013, the foundation was committed, thanks to its Mobile Learning Program®, to disseminate e-literacy throughout Lebanon, based on its strong determination to bring skills and knowledge to every community in every part of the country; based on its belief that it is vital for developing countries and emerging economies to rely on technology to improve their situation. From 2001 to 2013, the foundation was committed, thanks to its Mobile Learning Program®, to disseminate e-literacy throughout Lebanon, based on its strong determination to bring skills and knowledge to every community in every part of the country. For small countries with limited natural resources such as Lebanon, the development of human capital remains the greatest strength and source of potential. Information Technology (IT) and e-literacy in particular, became instrumental and fundamental headlines to the foundation’s capacity-building program. 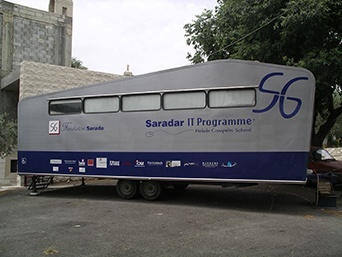 Four caravans roamed the country, the “Saradar IT Programme (SITP)®’, E-Caravan® Phoenix, the Cadmus Caravan® and the e-ecoeducation® caravan, respectively covering the regions of South Lebanon, the Bekaa Valley and Beirut-Mount Lebanon. MS Word, Excel, Office Outlook and Internet Explorer courses Customized training designed to answer local priorities and specific needs. The Mobile Learning Program® main purpose is to introduce the world of Information Technology to communities who do not have access to computers and the Internet because of income, education and/or location constraints. Based on the principles of “equal opportunities for all” and the “right to access information”. Through this initiative, Fondation Saradar was not only motivated to serve the community, but also seeks the direct participation of local communities in the project organization and implementation. Networking with NGOs has proven to be a very efficient and reliable approach to reach vulnerable social communities in Lebanon. NGOs’ staff members were strongly encouraged to enroll in Training of Trainers sessions to respond to the organizations’ needs. Strategic and long-term partnerships were built with private companies, local and international organizations and UN agencies to ensure the proper implementation and the sustainability of the project. Fondation Saradar Mobile Learning program presented an opportunity for private enterprises to engage in community programs and promote corporate social responsibility in Lebanon. The SITP was a concrete human development illustration of an effective and durable partnership between Business and Civil Society.This initiative was selected by the United Nations Development Programme (UNDP) / United Nations Volunteers (UNV) and the New Academy of Business (a UK-based institution) as one of the ten cases studies of the project ‘Enhancing Business Community Relations’. 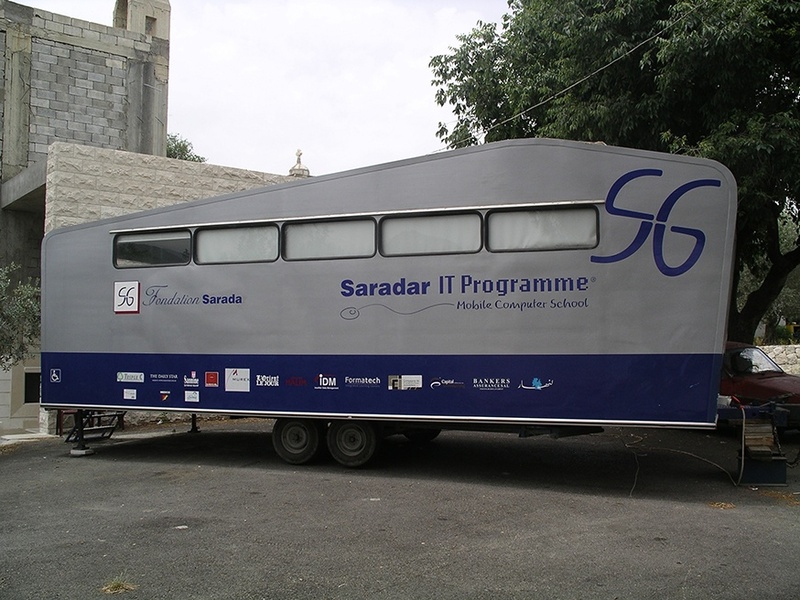 From 2002 to 2012, Fondation Saradar four Mobile Computer Schools® reached the following social groups and marginalized categories. 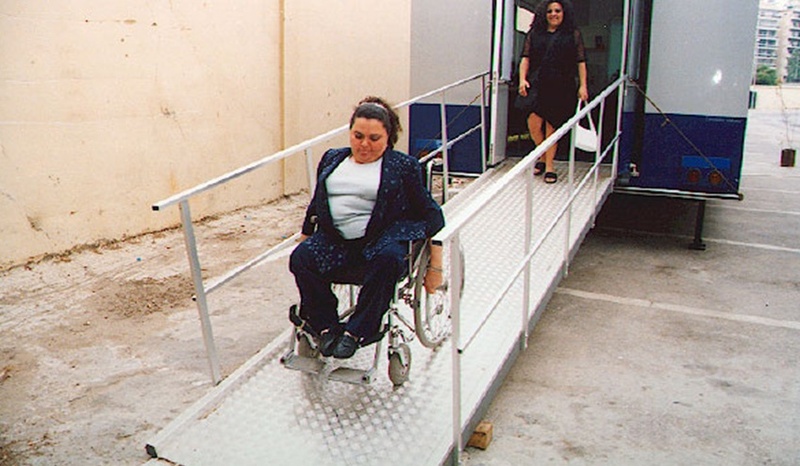 ‘The Accessibility Programme®‘ launched in 2003 is a program dedicated to provide basic knowledge of Computer and Internet to people with disabilities through a mobile school. This initiative sought to offer the opportunity to people who have disabilities to acquire the necessary skills and knowledge in order to achieve their basic economic right, the right to employment. 1) Build the competitiveness of job-seekers with disability on the labor market by developing their computer skills, and creating links between disabled people and the private sector. 2) Increase the awareness of the Lebanese civil society and private sector on the potentiality of people with disability. There is a strong gender component of underemployment among the disabled. Although graduate women of care institutions (specialized for people with disabilities) have higher levels of educational attainment than men, they are less likely to be employed. Only 35 percent of women were employed, compared to 52 percent of men. Disabled women face double discrimination in the Lebanese labor market. Due to this double discrimination that women with disabilities face, the project be targeted women with disability, ensuring their participation and equal opportunity in the work place. Full time jobs and internship opportunities were offered to some disabled persons once they completed the training. Thanks to the active collaboration of non-governmental organizations, to the involvement of private enterprises in community development and to the engagement of the media in promoting social issues, a durable and an efficient partnership was established. The ‘Adaptive Technology Programme®’ (ATP), a first in the country and in the region was launched in 2006. The program seeks to address the digital divide among people with disabilities who find themselves lagging behind and disadvantaged on the job market. In order to reach them efficiently, the SITP has developed the ‘Adaptive Technology Programme®’ (ATP) in partnership with the Young Association for the Blind (YAB). IT training has become a pre-requisite for increasing their chances of benefiting from a better social and economic situation, which in turn would lead to a better social integration. Mobile hubs have been equipped with special hardware and software featuring Arabic contents developed to facilitate the access of blind people to computers and the Internet.